From io9, Annalee Newitz presents the findings from a recent collection of studies on the evolution of tool use. Only humans and crows make tools of a specific kind for the acquisition of food - we both have learned how to use naturally available hooks or to fashion hooks to achieve a goal. It seems, based on one of the studies presented on the evolution of tool use in the Philosophical Transactions of the Royal Society B, gathered into a special issue on the subject, that animals develop tools in response to their environments. 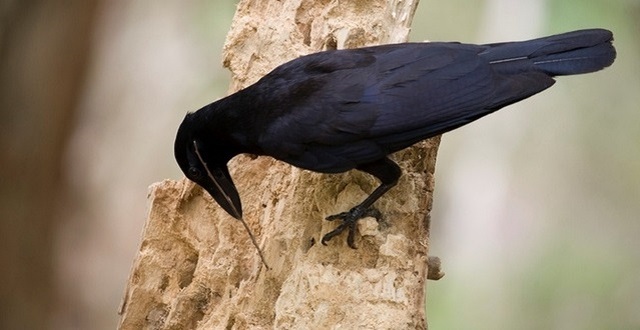 If the tasty little beetle larvae the New Caledonian crows love to eat were easily accessible, they likely would not have developed the hook tools they use to gather the larvae. Many animal species use tools, from insects, elephants and sea urchins to apes, badgers and octopuses, but there are only two animals who make hooks to catch food: humans and crows. Why we both do this is a mystery — and unraveling it could explain the reasons why tool use evolved in the first place. On the south Pacific island of New Caledonia, families of wild crows have developed a tool-making industry. One of their main sources of protein is beetle larvae, which are found in the rotted trunks of fallen trees. The problem is that the crows can't actually get inside the trunks with beak and claw alone. So they've learned to fish for the tasty bugs by fashioning tools out of slender sticks. Using its dextrous beak, a crow prepares the stick by stripping bark from one end. Then it tweaks the end into a small hook that looks something like the tip of a crochet needle. Carefully holding the stick in its beak, the bird dips it into bore holes in the logs, fishing out a meal. This isn't just some genetically-programmed behavior. Crows aren't born knowing how to make these tools; they teach the technique to their young. And they can improvise, too. In one lab experiment, a crow bent the end of a wire using the edge of a glass as a cantilever. It used the hooked wire to retrieve another stick, which was long enough to reach some food it wanted. So it used one tool to make another tool — and then used that tool to grab still another tool. That's pretty sophisticated stuff. On New Caledonia, crows use other tools as hooks, too. They carefully tear the barbed edges from the wide leaves of the pandanus plant, then dip these thin, serrated strips into bore holes, pulling up unwary insects caught on the tiny prongs. What we don't know is how well the birds actually understand their tools. Do they just understand that sticks mean dinner? Or are they clear on what kind of sticks get the job done? Two UK biologists, James St. Clair and Christian Rutz, recently studied crow tool use on New Caledonia, and found that the birds aren't just randomly trying different kinds of sticks on their prey — they know exactly what they're doing, and quickly recognized pre-made hooks the humans offered them. In a series of experiments where the researchers presented captured crows with different kinds of tools, the crows correctly went for the hooks, deploying them neatly to fish bits of meat out of a hole bored in a log. St. Clair and Rutz concluded that crows "paid close attention to the functional properties of hooked stick tools, with no need for trial-and-error learning." They've honed their fishing skills over generations. As an interesting aside, St. Clair and Rutz also found that crows seem to be "left handed" and "right handed" when it comes to their fishing sticks. When crows grip these tools in their beaks, most prefer to position the non-business end of the sticks pressed against their right cheeks, rather than their left. And no matter which direction the sticks were presented to them by the researchers, the crows would make sure to position the sticks correctly — aiming the hooked end directly at the meat. What we see in this study is one of the only detailed portraits of how crows understand their tools in the wild. There have been plenty of lab studies showing that crows can learn to be very deft tool-makers, like the one I mentioned earlier with the crow who made a hook out of wire. The problem is that animals in the lab nearly always show greater facility with tools — domestication seems to inspire more tool-using behavior. These wild New Caledonian crows were clearly creative, making hooks, repositioning them, and adapting pre-made tools for their uses. They convinced St. Clair and Rutz that crows regard hooks in pretty much the same way humans do, as flexible tools we make to get at desirable things (such as food) that are out of reach. 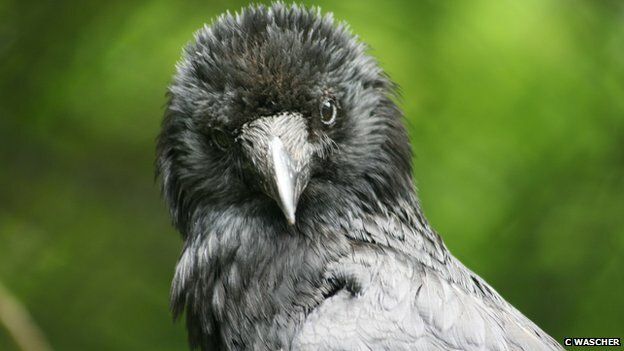 While that's fascinating, it still begs the question of why some animals like crows and humans have responded to their physical limitations by making tools. Why don't all animals do it? Last month, St. Clair and Rutz's findings appeared in a collection of papers on the evolution of tool use in the Philosophical Transactions of the Royal Society B. As biologist Dora Biro, archaeologist Michael Haslan and Rutz remark in the introduction to this collection, we still have a lot to learn about why tool use evolves in the first place. Obviously, using tools confers a great advantage — it helps animals get food more easily, and that's probably why such a diverse range of animals have adapted to grip tools in their beaks, claws, hands, trunks and mandibles. The question is, why does one group start using tools while another does not? A big problem is that it's hard to observe tool use in the wild, and even harder to compare the fitness of tool users with non-tool users to see whether one group clearly has an advantage over the other. A single study conducted several years ago, of bottlenose dolphins off the coast of Australia, offered an intriguing peek at tool development in action. One group of the dolphins started gripping sponges in their beaked mouths while they foraged for food in the rough sands of the sea bottom. Other groups in the same area never "sponged." Scientists observing the two groups found virtually no difference in how many offspring each had. There was no reproductive advantage to the dolphins' tool use, and therefore it was difficult to come up with an evolutionary explanation for their behavior. That's about to change. The authors of the new studies in the Royal Society collection do have some theories about why tool use evolved. One possibility — which could be relevant in the dolphins' case — is that tool-using groups gain access to food sources that non-tool users can't. So that means a group of tool-users can share an ecoystem with non-tool users, because they feed off different things. Tool use is a direct result of environmental opportunity. For an animal to start using tools, it obviously has to be in an environment where tools are available, and where using tools confers an advantage. This explains why, for example, sea creatures often use other sea creatures as tools. Biological materials are more available (and less likely to rot right away) in a marine environment where few sticks and rocks are floating around in the water column. Crucially, this explanation suggests that tool use doesn't evolve out of our needs. It develops out of what animals find in their environments. The New Caledonian crows wouldn't need to invent hooked tools if their favorite grubs typically lived in shallow holes that the birds could reach with their beaks. What this means is that animals will develop tools in response to their environments. Other environmental factors may affect tool adoption too. Riskier environments seem to spur tool use, perhaps because food sources are more difficult to come by. And in addition, animals with large toolkits — like humans — seem to invent more tools as their populations grow. This could help explain why humanity's population explosion over the past century has been accompanied by an explosion in tool diversity, including radical new technologies. Another key factor in tool use seems to be social learning. Species like chimps, crows, and humans all spend an extended period of time during adolescence learning from their families and social groups. And this confers a greater advantage when it comes to tool invention. One intriguing possibility is that when tool use has emerged in a species, it can actually change the course of its evolution, affecting both minds and bodies. Perhaps bipedalism emerged in humans partly because generations of people used their hands for tools. The people who could walk with tools in their hands, and whose hands had the best fine motor control, survived to reproduce more often than those who didn't. If tools can affect the course of our evolution, it could mean that our behavior has been changing our biology over generations. We know from brain imaging tests that animals treat sticks, hooks, and other tools as extensions of their bodies. Could these tools have changed our brains over time, resulting in this self/tool merging at the neurological level? That's one possible reason why studies of human children show that we're born with a predisposition to use tools. Maybe the urge to make tools is itself an adaptation. And that urge is something humans might share with species like crows, who are in other ways dramatically different from us. The fact that humans use tools doesn't make us unique among animals. Comparing ourselves with other tool users has helped us understand that the evolution of this skill is as much a reflection of our environment as it is any innate capability. Instead of looking at tools as a way we change the environment, it might be more accurate to think of tools as the most profound way our environments have changed us. Read the collection of papers in the Philosophical Transactions of the Royal Society B.